Adds lore-friendly, balanced improvements to the under-powered artifacts of Skyrim. 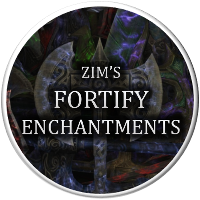 Bloodskal Magic - Enchantment Overhaul As intended by design, my mod adds the magic beams to a few artifacts that are also affected by Zim I.A. Spellbreaker Ward With out this all you will get is a very magika expensive greater ward. Translators are free to translate this mod into any language they like, please do credit me though. over-powered, to make their effects unique and invaluable, and to stay within the Elder Scrolls lore. This mod has been made to improve immersion. When I come across a legendary artifact that's boring or under-powered, I find it completely breaks immersion. 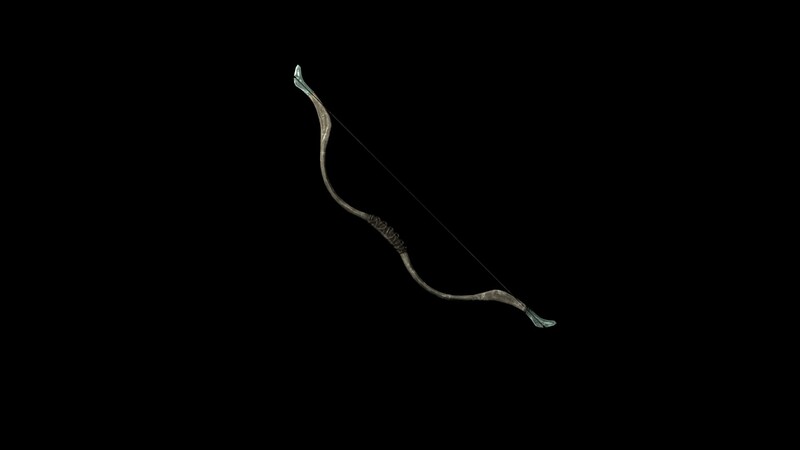 Auriel's Bow, for example: created by a god with craftsmanship that's said to have no equal, but it's less effective than a Glass Bow and its enchantment is mediocre. The weapon of a god shouldn't be so mundane. to over 50 of Skyrim's most legendary and famous artifacts. Most artifacts in this collection have new stats and all have new enchantments. Leveling has been removed, so all versions of these artifacts are the same at any level. Tempering recipes have been added where they were absent. seperately or as one, and the individual artifacts of the Ancient and Daedric Packs can also be installed individually or as one. Alternative texture and equipment-types are available for some of the artifacts. A full list of updates can be seen in the changelog below. No other mods are required to use this mod, and it's fully compatible with all my mods. DLC requirements are listed below. If installing all content, Dragonborn and Dawnguard are required. Please see the Compatibility questions section in the Q&A section for compatibility info. Place this mod lower in your load-order than any mods that might clash with it to avoid any issues. Please see the Common requests and Compatibility questions in the Q&A section before making a comment. 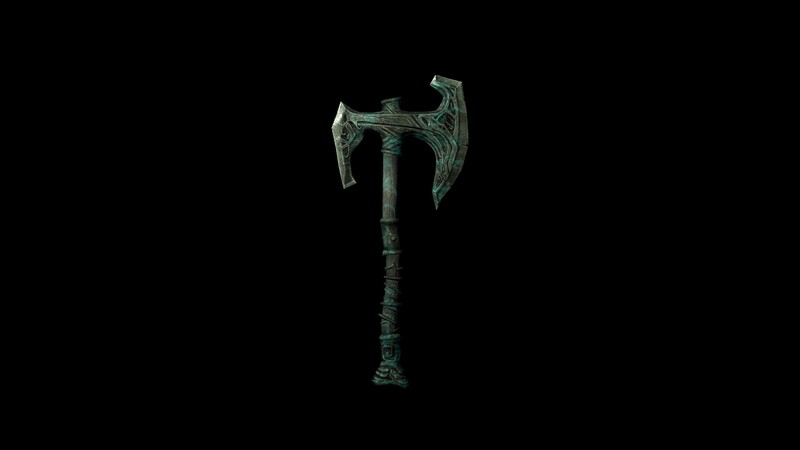 and its Fragments, Keening, Kyne's Token, Nettlebane, the Staff of Magnus, the Shield of Ysgramor, the White Phial and Wuuthrad. - New enchantment: Inflicts 45 points of sun damage. Undead targets take double damage. *There are three levels of charge with Auriel's Shield: 0, 1, 2 and 3 (at level 3, you can release the most powerful knock-back effect). At the different charge levels, the block effect is fortified by a different amount. At level 0, it's 30%. At level 1, it's 40%, then 50% at level 2 and 60% at level 3. *This effect applies to all foes, regardless of level, except the undead, dragons, daedra and automatons. *Note that the Bloodskal Blade now has a weapon charge. The weapon must be charged in order to use the energy blasts. - New enchantment: Target takes 30 points of frost damage to Health and Stamina. Target is 30% weaker to frost damage for 10 seconds. - New enchantment: Your skills are 10% more effective and increase 10% faster. - New enchantment: Absorbs 10 points of health, magicka and stamina. Note: I haven't included a tempering recipe for Keening as I don't believe it should have one. However, USLEEP does add a tempering recipe, so with USLEEP installed you'll be able to temper Keening with a dwarven ingot. - New enchantment: Doubles damage inflicted against animals. Increases your stamina by 50 points. - New enchantment: Necromancy spells are twice as powerful and efficient. * Increases your Magicka by 90 points. Reduces health by 35 points. Reduces stamina by 35 points. *Necromancy spells include resurrection spells and conjuration spells that summon the undead. This effect makes these spells twice as powerful (i.e. can resurrect more powerful creatures), last twice as long, and cost half the Magicka. - New enchantment: Sends spriggans fleeing in terror for 8 seconds. *With the Staff of Magnus equipped, magicka regenerates much faster and all spells are 50% more effective. The White Phial can be fully restored to hold an liquid once you've reached level 70 Alchemy and Enchanting skills. 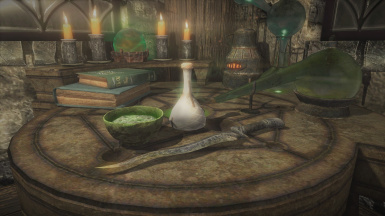 While under the influence of the Fortify Creativity effect (see the Nettlebane improvements) and with the Phial in your possession, activate the alchemy lab in the White Phial shop in Windhelm to restore the Phial. The ingredients required to restore the Phial are: a sample of Cursed Spriggan Sap (see the Nettlebane improvements), some Unmelting Snow (which can be taken from the same place as in the vanilla game once the Repairing the Phial quest has been completed), and some Mammoth Tusk Powder (which can be taken from the boss chest in Stonehill Bluff once the Repairing the Phial quest has been completed). Once the Phial is restored, you can re-align it to fill with a new liquid by placing a new liquid in the Phial using the White Phial Lesser Power. If you place a liquid added by another mod in the Phial, you will be prompted to add a patch so that the Phial can recognise it in the future. 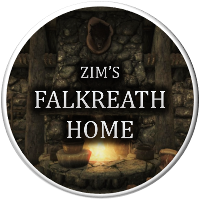 Note: if you uninstall this mod, the White Phial will disappear from your inventory and re-appear in the bedside drawers in the White Phial shop in Windhelm. Special thanks to Ghosu for the one-handed Wuuthrad mesh. the Rueful Axe and the Amulet of Articulation. 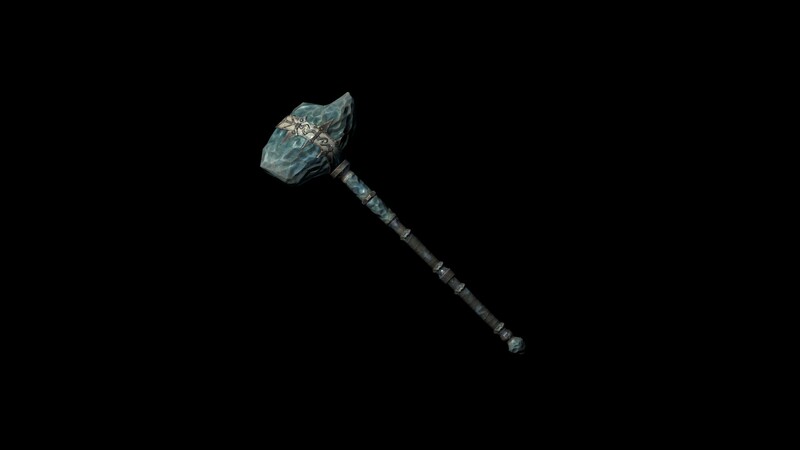 *The first time Dawnbreaker strikes an undead target, it will inflict an additional 20 points of fire damage and stagger the opponent. There is a 35% chance of inflicting a heavy stagger, and a 5% chance of knocking the target to the ground. **Powering up the Ebony Blade by killing allies now increases its physical damage, not its enchantment magnitude. 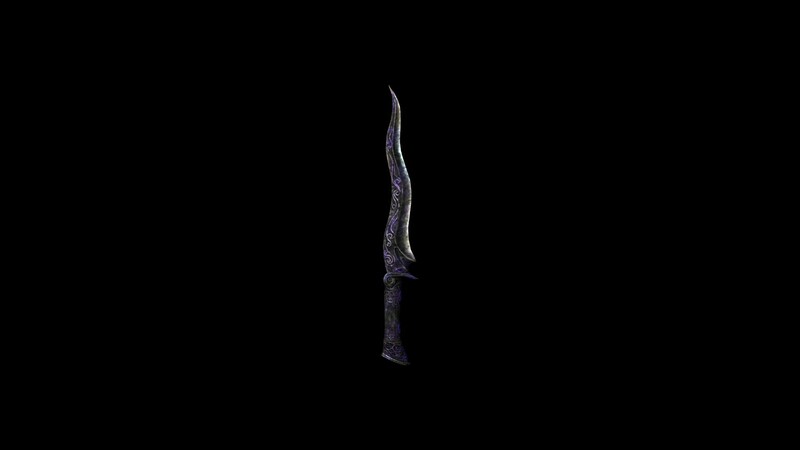 This means when you first receive the Ebony Blade, its damage will be lower but its enchantment will be at full power. - New enchantment: Confers a fire shield in combat that increases armor and fire resistance by 70 points. Muffles your movement. - New enchantment: Absorbs 40 points of magicka and stamina. Traps the target's soul if it dies within 15 seconds. - (V1.5) If you don't have a big enough soul gem, the Mace will still absorb the target's soul and will use it to recharge itself. 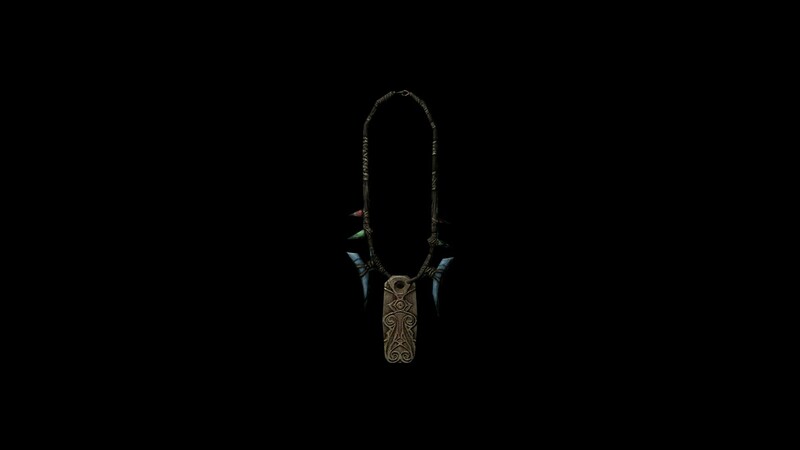 *Since the new enchantment is similar to the Amulet of Articulation, I have remade the Amulet as well. It is now named the Gloomwatcher Amulet, which has the following effect: Reveals the presence of life forces. Sneaking is 20% better. The detection effect can be enabled or disabled using the Gloomwatch lesser power. - New enchantment: Inflicts a corrosive poison that damages 10 points of health per second and reduces armor rating for 5 seconds. *The dragon soul requirement can now be edited by typing in the console command: "Set ZOI_SoulMin to X", where X is the number of Dragon Souls required to unlock a perk point. By default, one dragon soul is required to unlock one perk point, but you can edit this yourself. Open the console and type "Set ZOI_SoulMin to X", where X is the number of Dragon Souls required to unlock a perk point. Note: all updates to the Ring of Hircine have been designed to ensure compatibility with Moonlight Tales. - New enchantment: Increases your health by 60 points. Reflects 15% of incoming damage back on the attacker. (i) No more "Feed" option: Instead of an activation menu appearing with the option to "Feed", Cannibalism is now a lesser power. When cast, activate a nearby corpse to feed on it. (ii) Cannibalism without the ring: you can use the Cannibalism lesser power once you've equipped the Ring of Namira for the first time. From that point on, you can use Cannibalism any time you like, even when the Ring of Namira is unequipped or not in your possession. (iii) A new effect: Cannibalism will now grant you a very small boost to one of your skills. The boost you receive is doubled when wearing the Ring of Namira. 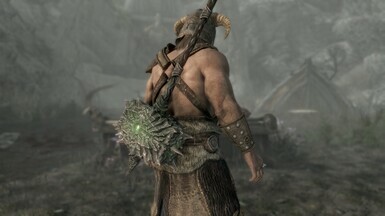 The skill that is boosted will be one randomly chosen from the target's highest skills (so for example, feeding on a Nord mage might boost your Destruction skill since mage's generally have high Destruction, or it might boost your Two-handed since all Nords have a natural talent for this). Cannibalism will also restore 25 points of health, or 70 with the Ring of Namira equipped. If you have an eating mod installed, such as Basic Needs and Diseases, eating a corpse will count as a small meal. - New enchantment: Magically sharpened, increasing physical damage when charged. *The summoned Dremora is levelled. 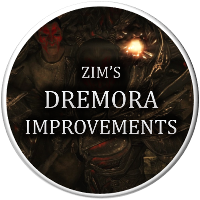 I strongly recommend downloading another of my mods, Zim's Dremora Improvements. - New enchantment: Increases Magic Resistance by 35%. Increased Poison Resistance by 35%. *Where X is the number of stolen dreams you currently have. Each use of the Skull consumes one dream, so to keep using the Skull you need to keep stealing dreams. - New enchantment: Blocking creates an impenetrable ward. - New enchantment: Absorbs 50 points of stamina. Sideways power attacks will paralyze targets for 8 seconds. *There are over 75 creatures the target may be transformed into, including but not limited to dremora, goats, draugr, chickens, ghosts, zombies, wolves, bears, falmer and cows. including his mask, armor and weapons. for a much harder boss battle with him. - (V1.5) New enchantment: Time between shouts is reduced 30%. Incoming magical attacks have a 30% chance of being absorbed. *Targets will remain paralyzed as long as their health remains low. As targets also take poison damage while paralysed, this effectively means targets are as good as dead the moment they are paralyzed. This makes it similar to the disintegration effect of shock damage. *Tentacle damage from Miraak's Staff and Miraak's Robes will only stagger an opponent once every 9 seconds. I've implemented this to prevent stun locking. - New enchantment: Increases your magicka by 70 points. Allows your Tentacle Armor to absorb 35 points of magicka. - New enchantment: Increases your stamina by 70 points. Allows your Tentacle Armor to absorb 35 points of stamina. including the sword, bow, hood, armor, gauntlets and boots. of Nightingale armor, including Improved Closed Face Helmets. *(V1.5) This effect only applies if the weapon's enchantment is charged. - New enchantment: Frost and shock magic is 35% cheaper to cast. * Illusion magic is 35% cheaper to cast. *This affects enchantment costs as well, meaning you frost and shock enchanted weapons will last longer. **Piercing weapons include greatswords, swords, daggers and bows. - New enchantment: Frost and shock magic is 35% less harmful to you. * Your light armor is 35% stronger. *This effect stacks on top of normal frost/shock resistance. - New enchantment: Increases your stamina by 50 points. Increases your magicka by 50 points. Muffles your movement. for the generic Thane weapons. You will receive the new Thane weapons as a reward for completing the Thane quests. Any vanilla Thane weapons you already have will be renamed Thane Status, and you will have to trade these for the new Thane weapons yourself using the new Thane Trade system (this is because vanilla Thane weapons are generic items and therefore can't be replaced through normal mod mechanics). To trade the old vanilla Thane weapons for the new ones, enter one of the Jarl longhouses (e.g. Dragonsreach), open your inventory and find the Thane Trade power. This mod is fully compatible with Hearthfire. Enchantment - Drain Voice: On striking a target, time between shouts is reduced by 20% for 20 seconds. This effect will stack when used on multiple opponents. It is capped at 80%. Many thanks to Unofficial Patch Project for creating the fixed mesh for this. Click here to see an image of this artifact. Enchantment - Frostfire Damage: Target takes 30 points of fire damage to Health and Stamina. 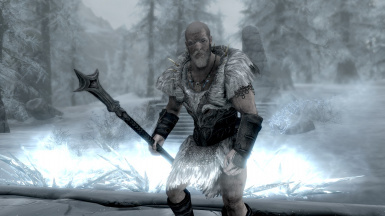 Like Frost Damage enchantments, Frostfire Damage is more potent when used to enchant Stalhrim weapons. Enchantment - Sprite Damage: Target takes 25 points of shock damage, and twice as much Magicka damage. Enchantment - Thaw Damage: Frost resistant targets take 15 points of damage. Inflicts greater damage on foes with high frost resistance. The effect is 25% more powerful if the target has 25% frost resistance, 50% more powerful if they have 50% frost resistance, or 200% more powerful against targets that are immune to frost. Does not affect automatons. Many thanks to PrivateEye for creating the mesh for this. Enchantment - Debilitating Poison: Inflicts 15 points of poison damage. Poisoned targets are slowed and take additional damage over time. *Health and stamina are fortified by 30 points each per kill up to a maximum of 150 points. 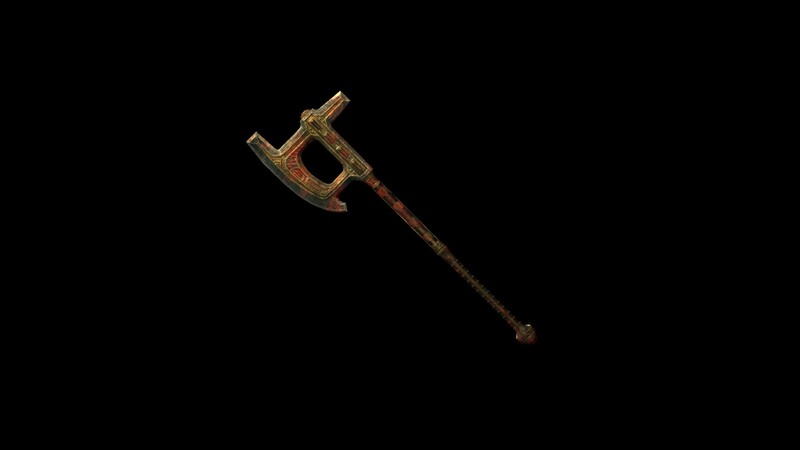 This weapon is also considered silver and will therefore inflict greater damage against werewolves and the undead. Enchantment - Conceal Killer: If target dies within 3 seconds, casts a powerful invisibility spell on the user that lasts 8 seconds. (V1.5) Does not affect automatons. (V1.5) Enchantment - Momentum Damage: Fired arrows gain momentum, damaging at least 10 points of health and causing greater damage over distance. This enchantment will also stagger and even knock down targets over long distances. Enchantment - Rip Magicka: Absorbs 25 points of magicka, inflicting 15 points of damage in the process. or in-game appearances, and equipment-types. or implement changes during the mod installation process. When installing the mod, you will have the option to install alternative textures for some artifacts. Click on the options below to view the new textures. This option changes the metallic details of Chillrend from golden (as in the vanilla game) to a quicksilver color. This option changes the metallic details of Chillrend from moonstone (as in the vanilla game) to a quicksilver color. This option also incorporates the LeanWolf's Better-Shaped Weapons design for Chillrend. This option changes the colored details of the Ebony Mail from blue (as in the vanilla game) to a dark grey color. Well suited to almost all other armor pieces, particularly ebony, guild-master and Nightingale armor. This option changes the colored details of the Ebony Mail from blue (as in the vanilla game) to red. Well suited to daedric armor pieces and Dark Brotherhood characters. This option changes the colored details of the Mace of Molag Bal from red (as in the vanilla game) to purple. This suits the purple enchantment color added by Zim's Immersive Artifacts. 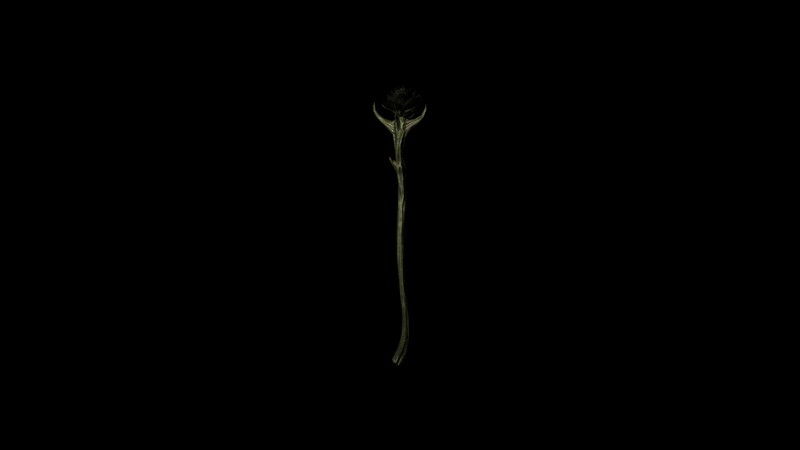 This option changes the color of Sanguine Rose's petals from red (as in the vanilla game) to black. This option changes the color of Sanguine Rose's petals from red (as in the vanilla game) to white. This option changes the color of Sanguine Rose's petals from red (as in the vanilla game) to purple. This option changes the color of the Savior's Hide from brown (as in the vanilla game) to a dark grey color similar to the hide of a black bear or a werewolf. This option changes the color of the Savior's Hide from brown (as in the vanilla game) to a pale color similar to the hide of a snow bear or a ice wolf. This option changes the colored details of Volendrung from red (as in the vanilla game) to green. This suits the hammer's green enchantment color. You can change the equipment type of some of the Daedric Artifacts (e.g. 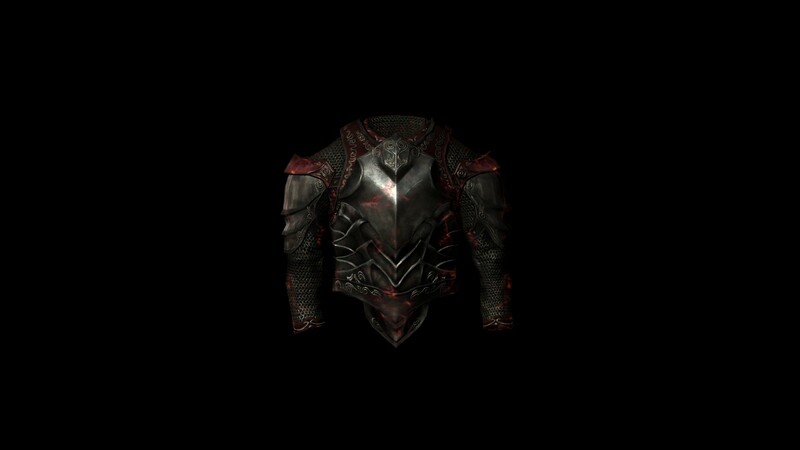 switch between Heavy Armor and Light Armor versions, or between One-Handed and Two-Handed versions). These changes need to be implemented by you in-game. To make the change, equip the artifact while standing next to the Shrine of the associated Daedric Prince. Alternatively, each artifact has a switch global you can modify using console commands. If you equip an artifact while its global is set to 1, it will switch. 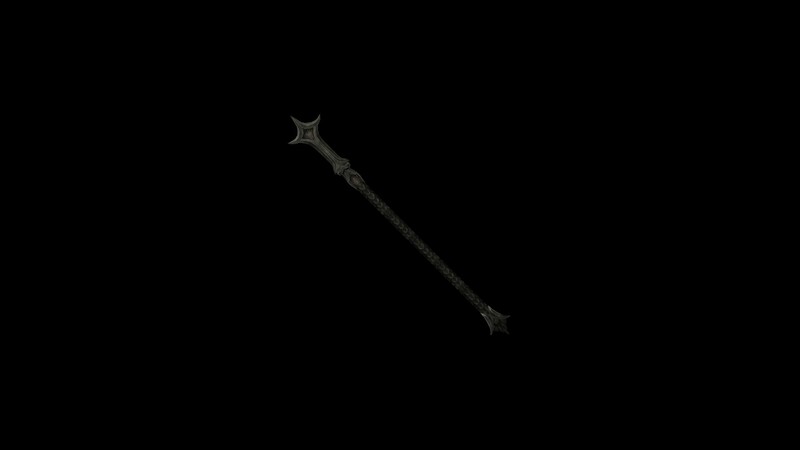 For example, Dawnbreaker's associated Prince is Meridia and it has a global named ZDB_Switch. To obtain a two-handed Dawnbreaker, equip it while standing next to the Statue of Meridia west of Solitude. Alternatively, open the console and type in "set ZDB_Switch to 1", then equip Dawnbreaker. To switch back, open the console and type in "set ZDB_Switch to 0" and re-equip. WARNING: If uninstalling this mod, artifacts you've switched for alternative equipment types must be restored to their vanilla types or they will be lost. 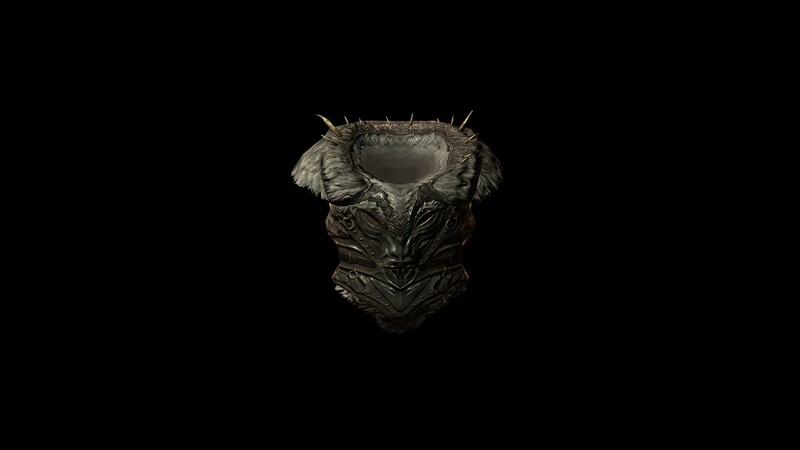 This mod includes a new texture for the Gauldur Amulet. Because the mesh and texture for this amulet is not specific to this one artifact (Kyne's Token and the Saarthal Amulet have the same appearance), and because edits are required to the mesh files themselves, I have had to implement the new texture through the .esp file. Therefore, this texture update is not optional, unlike the other alternative textures provided. Click here to see the Gauldur Amulet's new texture. You can convert Wuuthrad into a one-handed version. This isn't lore-friendly. The Daedric artifacts I have provided alternative equipment types for don't have their properties specified in lore (e.g. nowhere is it written that Spellbreaker is a Heavy Armor piece), but Wuuthrad is noted as a two-handed battleaxe. I was therefore tempted to leave this option out of my mod, but in the end, I expect some people will appreciate me leaving it in. To obtain a one-handed Wuuthrad, you'll need to complete the Companions quest line and speak to Eorlund Grey-Mane, who will tell you the Skyforge now feels more "awake". You'll need an Ebony ingot. You can forge it back to a two-handed version at the Skyforge at any time. This section offers some answers to questions you might have. Please check this section before posting any questions. Q) Do I need to start a new game to use this mod? A) No. Even if you already have an artifact in your possession, it will still work when this mod is installed. 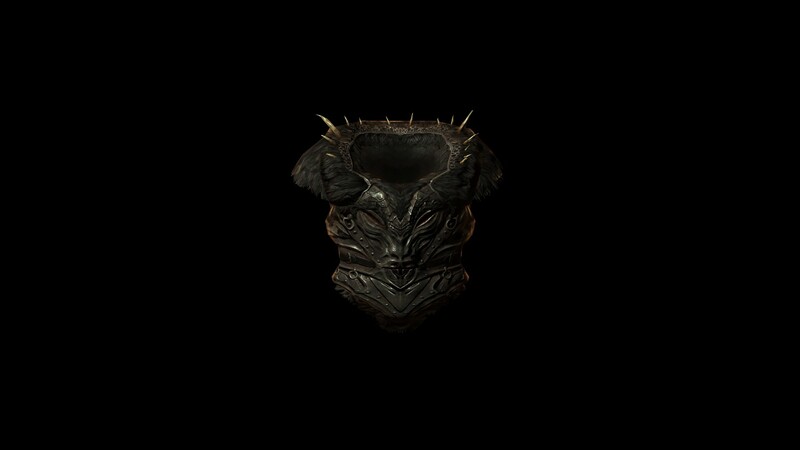 For clothing pieces (ring, shields, armor, etc.) be sure to unequip and re-equip if you are wearing the item when the mod is installed. Q) Can I update from a previous version (e.g. V1.3 or V1.4) without starting a new game? A) This is not recommended. Updating from a previous version may work for some (in testing it always works for me), but there's always a possibility that it will cause bugs, especially if you're running a lot of mods. Q) I was hoping for BASH tags, why haven't they been included? A) It was too much work for me to learn how to use them. It's taken me over a year just to make this update (mainly because I have no time to mod these days), and I decided that it wasn't worth my time to learn how to implement these tags. Q) I preferred V1.4 of an artifact to V1.5, why the change? Q) Can you create a version with unlimited charges? A) No, this is not lore friendly and is therefore not in keeping with this mod's ethos. Q) Can you make the artifacts disenchantable? A) No. Many of the new enchantments are unique and wouldn't work as generic magic effects. More than that, though, the lore requires these items to be non-disenchantable, and I'm sticking to the lore in this mod. Q) Can you update another artifact? A) No, I've looked at all the artifacts in Skyrim and only amended the ones I feel need updating. I don't want to spend forever updating things that don't require updating from a lore perspective. Q) Can you make a patch for X mod? A) No, I won't be making any patches for this mod as I don't have time. The mod has good compatibility so I don't think a patch is even necessary for most playthroughs, so I simply don't want to dedicate all my time to creating patches for this. Sorry! Q) Can you create a two-handed version of Dawnbreaker that includes a sheathe? A) No, it's physically impossible to draw a sword from your back if its sheathed and the sword is longer than your arm. Sheathed greatswords are unrealistic and not something I want to spend any time implementing in ZIA. Sorry! Q) Can you create more alternatives? Maybe a one-handed Volendrung, for example? A) Those artifacts for which I have not provided alternatives (such as Volendrung, the Rueful Axe, the Ebony Blade and the Savior's Hide) have been left without alternatives for a good reason. Some of these artifacts are required to be two-handed for their enchantments to work, others simply wouldn't make sense from a lore-perspective as an alternative (e.g. the Savior's Hide is clearly not heavy armor). Q) Why hasn't the Aetherial Crown / Harkon's Sword / the Jagged Crown etc. been updated? A) To save time, I've focused on artifacts the lore says should be more powerful. Other artifacts are either unmentioned in the lore, or they match their lore descriptions. Q) Can you bring back the new artifacts from IAC? A) I got a lot of feedback from people requesting a simple mod that updated artifacts without adding more. Because of that, and to save time, I removed all my new artifacts. I have very little time for modding these days, but if I find some, I will re-add these add my own artifacts as a separate mod. Q) Can you bring back Gauldur's Refuge from IAC? A) This is something I may implement in the future, and if I do, it will be as an independent mod unrelated to this one (though I will make them compatible). Yes, BUT, not all the changes implemented by USLEEP and Morrowloot are implemented in ZIA. I recommend placing ZIA lower in your load order than USLEEP and Morrowloot to avoid these mods causing any changes to the artifacts you want improved by ZIA. Q) Is this mod compatible with Unique Uniques? Q) Is this mod compatible with X mod? A) I can't test this mod against everything, so I won't always know. Overall, this mod has good compatibility. It doesn't require SKSE or any other mods. It will run with Unique Uniques, Ordinator and Morrowloot (though you should place it after Morrowloot in your load order). If a mod edits .esp files (for example, if it changes stats or enchantments), then generally it won't be compatible. However, you can usually still have both mods installed, though only the mod lowest in your load order will appear to work. Q) I'm running another Cannibalism overhaul, will this be compatible with the Ring of Namira? A) Depends on how that other Cannibalism overhaul works. I'd suggest you test it yourself...might be they're compatible, might be they're not. Q) The Bloodskal Blade has no charge and isn't firing properly, what's the problem? A) The Bloodskal Blade may clash with other mods that amend it, especially if you're running BASH tags, which ZIA doesn't have. To fix this issue, make sure the amends to the Bloodskal Blade are being implemented by this mod and are not being overwridden by another mod. Often it's as easy as just making sure ZIA is as low in your load order as possible. Q) The Ebony Blade has no charge, what's the problem? A) The Ebony Blade may clash with other mods that amend it, especially if you're running BASH tags, which ZIA doesn't have. To fix this issue, make sure the amends to the Ebony Blade are being implemented by this mod and are not being overwridden by another mod. Often it's as easy as just making sure ZIA is as low in your load order as possible. Q) The Ebony Blade isn't improving when I kill allies, what's the problem? A) This is a bug. The Ebony Blade is buggy, even in the vanilla game. I haven't touched the mechanism that counts allied kills, and I've implemented some additional scripting that should help correct any bugs to the vanilla mechanic, but there's nothing I can do to fix it completely. Q) All my thane weapons are now named Thane Status, why is this? A) The vanilla thane weapons are not unique items and therefore can't be replaced in the traditional way. As such, all old versions of the thane weapons will be named Thane Status and must be traded for the new versions by you in-game. See the Thane Weapons section above for information on how to do this. Q) Something is invisible or not working properly, what's the problem? A) A fairly common issue with mods like this is that scripts or textures aren't properly unpacked when installing. I suggest re-installing and checking your data folder if you have any issues. Q) The enchantment/damage/armor rating isn't what it should be, why is this? A) This is usually a result of a mod conflict; check your load order and make sure ZIA is lower than any other mods that might edit the artifacts. Q) Why doesn't Chillrend have a sheathe even if I install the reshaped version? A) For some reason, the Special Edition version of the reshaped Chillrend doesn't display the sheathe. I've no idea why and didn't want to delay releasing this mod by delving into it. If you discover what the issue is, do let me know! Q) When I have Miraak's mask equipped my conjuration spells don't always work, why is this? A) This is an unfortunate side-effect of spell-absorption, and there's no way around it. Basically, when you cast a conjuration spell, you have a 30% chance to absorb the magicka from that spell instead of feeling the effect, just like hostile spells. Q) I preferred V1.3 of an artifact to V1.4, why the change? Q) Why do the Bloodskal Blade and the Ebony Blade have charge now? A) The Bloodskal Blade and the Ebony Blade have unlimited charges. These are odd exceptions to the rules established in the game lore that magic weapons require charge, and when looking into why this might be, I became convinced that the vanilla versions of these weapons were simply too complicated to work with charges from a technical point of view. In my update, I found a way to ensure these weapons retained their charges. This is closer in line with the lore of the Elder Scrolls, which is one of the main aims of my mod. This section describes all the changes to this mod across the various version. The main aim of this update was to minimise and improve scripting for improved smoothness and reliability, to fix reported bugs, and to amend any artifacts I thought could be improved. 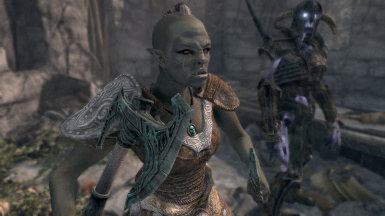 In particular, the Wabbajack, Deep-Rout, the Mace of Molag Bal and Miraak's equipment have been amended significantly. 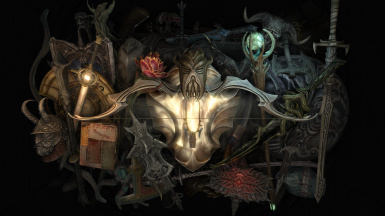 Additionally, this update included new updates to the Skeleton Key, Keening, the White Phial, and the much-requested Necromancer's Amulet. The version suffix has also been removed from the file names. This is so that any future updates don't cause issues when updating. - Description update to: Absorbs 40 points of magicka and stamina. Traps the target's soul if it dies within 15 seconds. - Description updated to: Reveals the presence of life forces through walls. - Description updated to: Inflicts a corrosive poison that damages 10 points of health per second and reduces armor rating for 5 seconds. 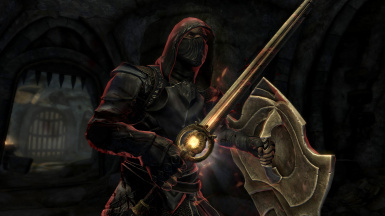 - A new enchantment for Miraak's Sword: Inflicts 40 points of poison damage. Paralyzes targets on low health with poisonous tentacles. 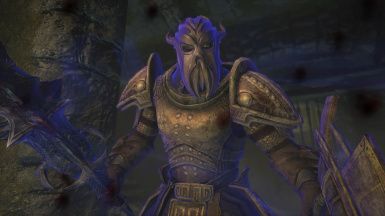 - Increased spell absorption on Miraak's Mask to 30%; decreased shout cooldown time to 30%. - Changed name to "Necromancer's Amulet"
- New enchantment: Necromancy spells are twice as powerful and efficient. Increases your Magicka by 90 points. Reduces health by 35 points. Reduces stamina by 35 points. - Black Whisper spell renamed to "Conceal Killer"
- "Crimson Shock Damage" renamed "Sprite Damage"
The main aim of this update was to incorporate appropriate changes from USLEEP and Morrowloot (MLU) into ZIA. There are no instances where the artifacts I've amended are identical to USLEEP and MLU; rather, I've used USLEEP and MLU as a basis for adding things like proper sound effects and keywords to the artifacts in ZIA. Additionally, this update has included extensive tweaks to improve balance, bug fixes, changes to effects in some cases (where previous effects were bugged, underwhelming or too far from game lore), and even the implementation of new textures and equipment types for some artifacts. I have also created a formula for determining the values of the various artifacts so that their values are consistent (therefore almost all artifacts have had their values changed). I've also included the Bloodskal Blade, Chillrend and Kyne's Token, as well as a new pack including Miraak's equipment in this update. New enchantment: Inflicts 30 points of magical damage. Power attacks release energy blasts that deal 50 points of damage. New enchantment: Target takes 30 points of frost damage to Health and Stamina. Target is 30% weaker to frost damage for 10 seconds. 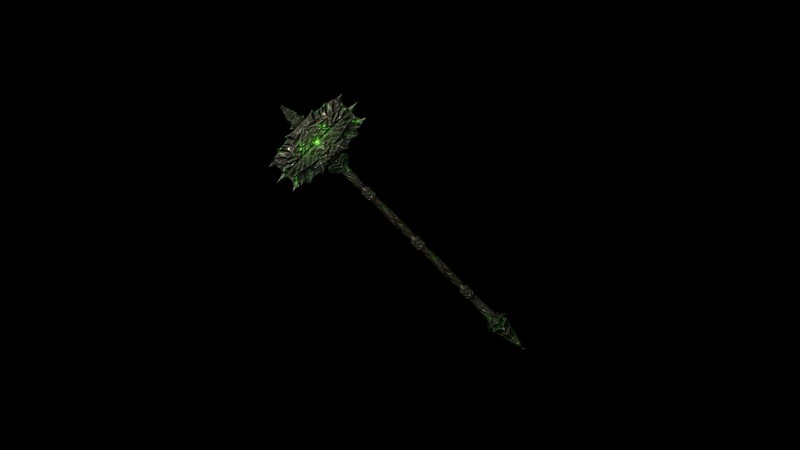 *The first time Dawnbreaker strikes an undead target, it will inflict an additional 20 points of fire damage, and it will always stagger the opponent. There is a 35% chance of inflicting a heavy stagger, and a 5% chance of knocking the target to the ground. 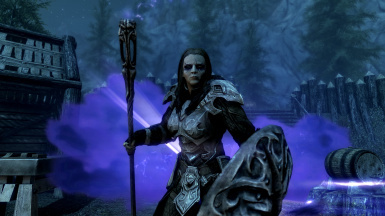 Powering up the Ebony Blade now increases its physical damage, not its enchantment magnitude. 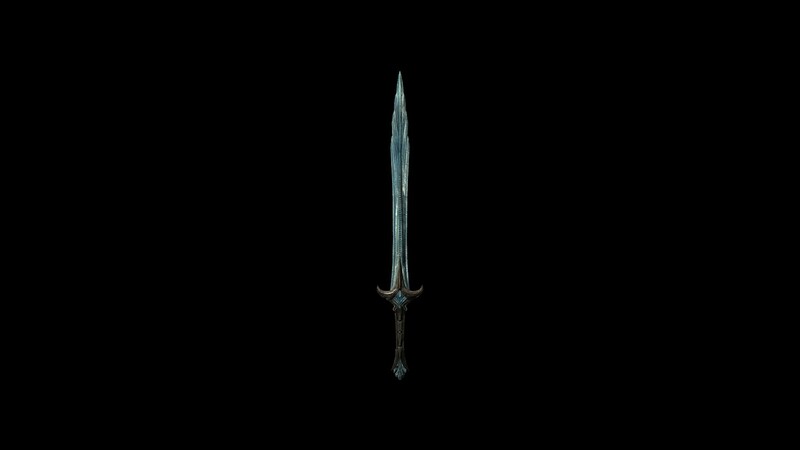 This means when you first receive the Ebony Blade, its damage will be lower but its enchantment will be at full power. New fragments enchantment: Combat / Magic / Stealth skills are 10% more effective and increase 10% faster. Gauldur enchantment: Your skills are 10% more effective and increase 10% faster. New enchantment: Doubles damage inflicted against animals. Increases your stamina by 50 points. New Enchantment: Reveals the presence of nearby life forces through walls. Sneaking is 20% better. New enchantment: Absorbs 15 points of health, magicka and stamina for 3 seconds. Description of enchantment changed: Sprays writhing tentacles on the ground that stagger foes and inflict 25 points of poison damage for 3 seconds. Effects now work with a direct hit on the target as well as when sprayed on the ground. Foes can now only be staggered by tentacles once every 9 seconds. This has been done to prevent stun-locking opponents. New enchantment: Time between shouts is reduced 35%. Has a chance to absorb the magicka from dragon breath and spells. New enchantment: Increases your health by 70 points. Tentacles inflict 35 points of damage and stagger nearby foes when struck. New enchantment: Increases your magicka by 70 points. Allows your Tentacle Armor to absorb 35 points of magicka. New enchantment: Increases your stamina by 70 points. Allows your Tentacle Armor to absorb 35 points of stamina. Remade the loot drops for spriggans: removed burnt, golden and violet spriggan sap. Spriggans now drop their normal ingredients (e.g. taproot or burnt spriggan wood). 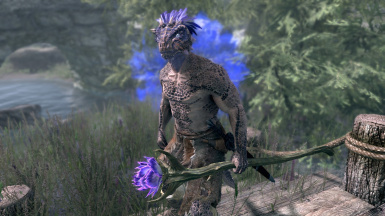 If struck with Nettlebane, all spriggans (except burnt spriggans) have a chance to drop additional spriggan sap and will always drop one portion of corrupted spriggan sap, which has the same effects as spriggan sap and can be used to make powerful crafting potions. Changed the effects of spriggan sap to ensure balance: now damages health, fortifies smithing and fortifies enchanting at a normal magnitude (so can’t be used to create OP weapons or enchantments) but for a longer duration. Maintains the Fortify Creativity effect. Wording of hood enchantment updated to make it clearer the effect affects enchantments as well as spells. Feeding now restores 34 points of health or 58 points on health depending on whether you’re wearing the ring or not. Remade the Cannibalism Power: instead of targeting your food, activating this Lesser Power now means that for five seconds, any dead NPCs you activate will be eaten. Updated description to: Absorbs 25 points of health per second. Improves spellcasting when equipped. 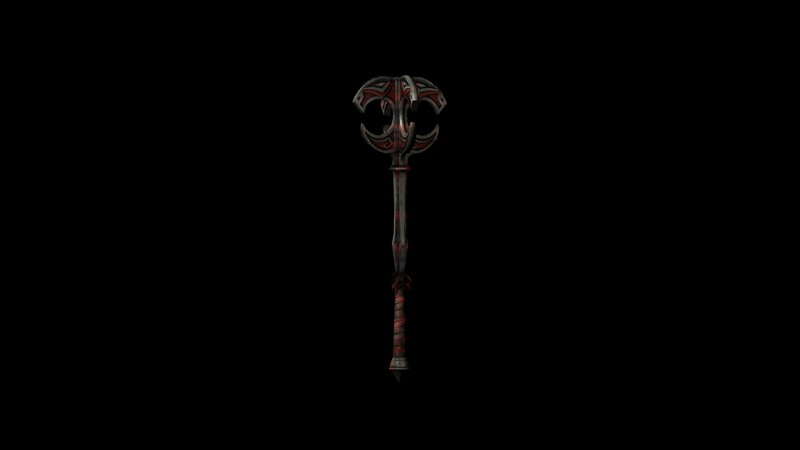 Staff of Magnus (new effect): Spells are more effective and magicka regenerates much faster when the Staff of Magnus is equipped. 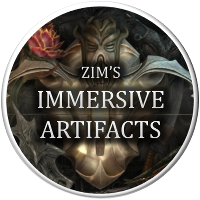 All individual mods included in Zim's Immersive Artifacts are designed to be easily merged into a single esp file. I've written this guide for those who want to pick-and-choose from this collection and create their own merged mod. (v) Be aware that all the .esp files provided in this mod have short names because merging several files with long names can cause issues; please see a list below which details the contents of each .esp file. (i) Open TES5Edit. You'll then get a list of all the .esp files in your Skyrim Data folder, which will include all the .esp files of Zim's Improved Artifacts you have downloaded and installed with a mod manager (e.g. Nexus Mod Manager). Only load the .esp files you want to merge. This may take a while to load, but be patient...it rarely lasts longer than a few seconds. (ii) Once the list is loaded, select all the mods you want to merge. Right click and select "Apply Script". You will then be given a list of scripts to choose from; from this list, select "Merge plugins v1.9" or whatever the most up-to-date version is. Select "OK". You'll be prompted to select the esp files you want included in this final merged mod...make sure all the .esp files you want included are ticked and press "OK" again. (iii) Create a new file and give it a name (e.g. "My Immersive Artifacts"). If it's your first time using this script, you may be asked to customize some settings...I suggest sticking with the default options unless you know what you're doing! (iv) This will create a single .esp file. Exit TES5Edit to finish the process.